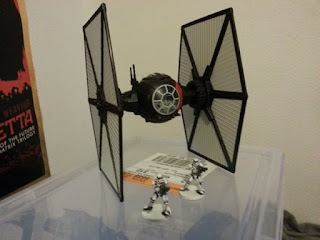 I've been looking for a while for some Star Wars themed vehicles/ships that would match miniatures in 28mm scale (like the ones for Imperial Assault). Recently thanks to the upcoming movie (guess which one!) I was able to find a great (and affordable) match... And it was in the toy section of my local department store! And what I'm doing with this stuff? Well, I'm looking forward to play Deadzone using as proxy the star wars miniatures!